During March we celebrated “Reuse” at CreativeMornings events around the world. Now for May, we’re excited to announce our next theme: “Backwards.” Our past Chicago host Mig Reyes selected the theme and the talented Chicago-based photographer Paul Octavious provided a photo for our monthly illustration. A few speakers from our 50 participating cities include Pam Goldsmith-Jones (Vancouver), Mira Kaddoura (Portland), and Seth Godin (New York). 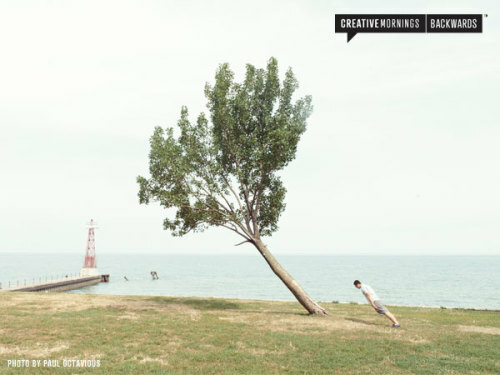 To find a May event near you, keep your eye on creativemornings.com, or follow your local chapter on Twitter. As always, free tickets are available starting the Monday before the talk. Join CreativeMornings/Austin on May 17th for our “Backwards” speaker, Gerren Lamson—local designer, illustrator, typographer and Chief Creative Officer of Creative Market. Tickets go live here on Monday, May 13th at 11AM sharp.